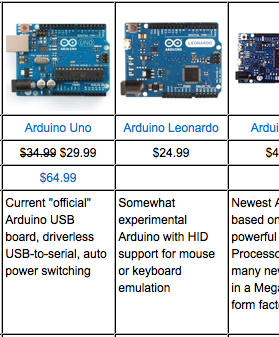 Maker Shed has a new Microcontroller Comparison chart comparing six Arduino variants, the Raspberry Pi, and the BeagleBone. I’m still amazed by the hobbyist wonderland that we live in these days — the number of choices, the capabilities, and the low costs are unbelievable. For a nice introduction video to the Arduino series, see the descriptions at robotshop.com and the video at the bottom of the page. This entry was posted in making, tech on December 19, 2012 by karl.kranich.